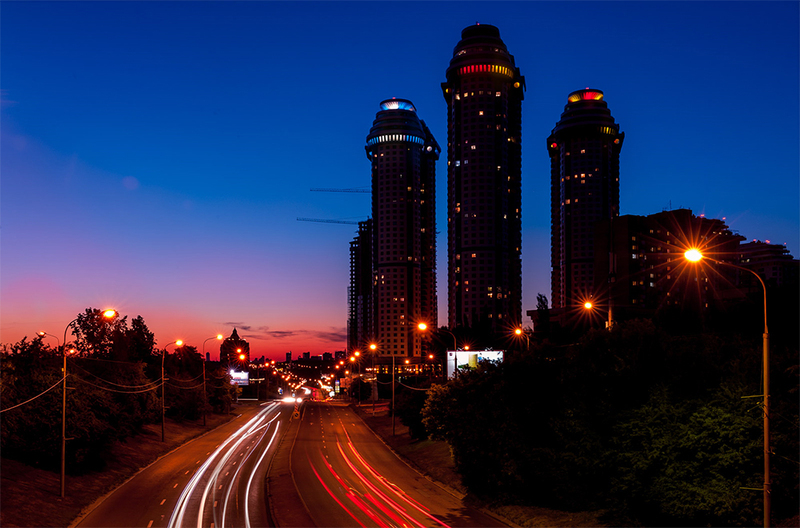 In celebration of the 2014 World Cup final game, the three towers of “Vorobievy Gory”, an iconic residential complex in Moscow that faces the German Embassy, were lit during the match with the colors of Germany and Argentina’s national flags. With only a single day to light the towers, lighting designer Sergey Babaliants was brought in to program the tower’s existing system, which includes 198 Exterior 200 fixtures. Installed in 2006, the exterior lighting for each of the three towers features 30 Exterior 200s for the “crown,” located on the roof level and 36 Exterior 200s for the “gallery,” located three floors below the crown. The design is controlled via LightJockey placed on the second level below the middle tower, while the left and right towers were connected through wireless DMX signal via an omnidirectional antenna on the roof of the middle tower. The lighting design for the World Cup’s final match was pre-programmed to ensure the right tower was fixed with the German colors and the left with Argentina’s, while the middle tower alternated between each nation’s colors every 15 seconds. One of the project’s major challenges was the tower’s aging and poorly maintained existing system.